Parks Industries is based out of Marion, IL and is the sole manufacturer of the HP2000 Auxiliary Power Unit. With over 10 years in production, the HP2000 has proven to be the most capable, dependable APU on the market. The HP2000’s patented heat pump technology provides both heating and cooling to the truck’s cab and does not require an additional heating system like most other APUs. Parks Industries is focused on providing the very best in idle reduction systems to the transportation, construction and military industries world-wide. Their vision for excellence is apparent in the quality of the products that they provide. Parks Industries is always on the cutting edge of technology. We are constantly looking ahead at ways to improve the HP2000 to make it more efficient, lighter weight and most economical for our customers. Being the pioneer of new technology is not easy but the HP2000 seems to always be on the forefront of new innovations. Our vision is laser focused on being the best at what we do and our product shows it. Parks Industries strives to provide the very best idle reduction system available. To be the best, you not only need a great product, you must stand behind that product as well. We strive for 100% customer satisfaction with every unit that rolls off the line. From the single truck owner operator to the fleet manager in charge of thousands, we treat each customer with respect and dignity and offer them our full support to accommodate them in any way possible. Having a fleet of his own in the past, our owner, Gary Parks, knows the struggles of owning and maintaining a truck. With this being said, he also knows the value of a dependable APU. He has worked extensively with his suppliers to source the very best yet most economic parts available in the manufacturing of the HP2000. The HP2000 provides all of the features of other APUs yet costs thousands less. Finding the best product for the money is what everyone strives for and when it comes the APUs, you have found it with the HP2000. Without a goal, how do you know where to aim? Parks Industries is always looking ahead and setting new goals to achieve. In 2015, the HP2000 was rated the #1 APU on the market. Since the first unit that was sold, our goal has been to be the best. The ranking was from customer reviews of our product and there is no better honor than to have those who personally own the HP2000 to feel that they have the best product on their trucks. The first prototype was put into testing. It was huge at over 34” wide and consumed about 0.3 gallons of fuel per hour. At the time, it was still much less than the 1.1 gallons per hour that the truck would consume idling. It was powered by a one cylinder engine and was extremely loud. The unit was reconfigured to a smaller cabinet and the HP15 was born. It contained a Perkins engine which reduced the fuel consumption down to 0.15 gph. The cabinet width was narrowed to 24” the engine noise was drastically reduced. A new cabinet design, down to 21” width, and some internal component changes birthed the very first HP2000. This cabinet design with it’s signature diamond plate lid would turn out to be the first version to be recognized as a major player in the APU market. With the change of the engine from the Perkins to an overhead cam, 2 cylinder Kohler engine, the HP2000 K Series was born. The K Series offered a 345 lb total weight and was only 69db making it one of the quietest APUs on the market. The HP2000 Xtreme was the next in line with a new, sleek cabinet design, larger lid for easier access of servicing as well as a new weather strip which help prevent the elements from entering the cabinet between the cabinet body and the lid. 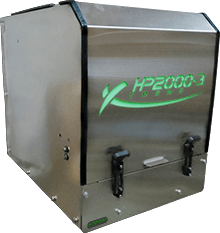 This new patent pending design also was the first to offer an interior cabinet light which allowed the HP2000 Xtreme logo to illuminate through the cut out in the lid while the unit was in operation. The latest version of the HP2000 is the HP2000 Xtreme Slim. The cabinet on the Slim has been narrowed to only 18” which allowed for additional technology to be implemented allowing for a significant increase in BTU rating. The Xtreme Slim now boasts over 20,000 BTUs in both heating and cooling making it one of the highest BTU rated APUs on the market. Other additions to the Xtreme Slim include an automatic belt tensioner as well as a new cabinet option. The Slim is available in both the standard, black powder coated version as well as an all new stainless steel cabinet version. Following in the foot-print of the Hp2000 Xtreme, the HP2000-3 Xtreme rolled out in 2017. Keeping the same dimensions as the HP2000 Xtreme, the HP2000-3 Xtreme had been updated with a bigger three cylinder Perkins engine. Using a three cylinder engine cuts noise level down and also decreases vibration. This unit comes standard with a 120 volt alternator and a stainless steel cabinet. Reaching perfection is not always easy, or done quickly. But the new 2-cyl Kubota powered HP2000 Xtreme is one of our greatest achievements in this company. Using the same dimensions as its immediate predecessor, but now with a 65 amp alternator; our newest APU is quieter, has the lowest amount of vibrations of all our units, and on top of that it is by far the lightest APU on the market, coming in at only 310 lbs totally installed.